You may start to see the kids return to school and the blockbusters leave the multiplex, but don’t be fooled, summer is far from over. The official end of summer isn’t until September 22nd, and that means that we are still susceptible to the season’s effects and although it might feel like it is over, the heat of summer is very much still around. Precautions need to be made in rising temperatures, both for us and for our Labradors. If you want the best for your pooch, then heed these hot weather tips. Dogs have more in common with humans than we might think, especially when it comes to what we eat to stay cool. So also try feeding your dog summer fruits. Watermelon and berries are great treats for your dog, and the water content will keep their body temperature down. You can feed them just about every type of fruit except grapes and raisins as these are toxic to them. 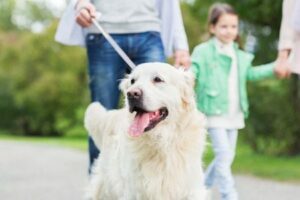 You can attempt all of the precautions you want, but if you are not attuned to the warning signs of doggie dehydration, then you are not adequately protected. Watch for dogs that show signs of weakness and difficulty breathing. If you notice these signs, then get your Lab some fluids and contact the vet. When considering your dog’s safety in the heat, think about how you behave in the heat. You would want to spend a lot of time in the shade, so keep your dog in the shade on those hottest days. You wouldn’t want to walk on hot asphalt on your bare feet so don’t let them stand there on their pads for too long. You might like to take a dip in the pool on scorching days so do the same for Fido. If the temperature seems bearable and you want to go on a longer walk, then do so, but bring supplies in case of an emergency. Bring some water, a collapsible water bowl, and a damp towel for use in extreme circumstances. It is always better to be safe than sorry. At KT British Labs, we always consider the safety of our Labs to be of the utmost priority. That is why we want to keep our pups cool and healthy. We even make sure that the dogs we offer are up to date on shots and antibiotics. Contact us to learn more about our services.